Greece is one of the most popular destinations for honeymooners. Its amazing landscapes, delicious cuisine, luxury hotels and sandy beaches make it a great choice for your honeymoon. In this article we aim to give you some ideas and assist couples with planning their Greek honeymoon to create enjoyable moments by selecting some of the best hotels, restaurants & activities etc. In this first edition of our “honeymoon section” we will cover the 3 most popular islands; Santorini, Mykonos & Crete. Be sure to check back again later for our second edition in which we will explore additional island options. We prepared this guide for you so that we can better assist you to create a memorable Greece honeymoon package designed with your preferences in mind. Therefore you need to choose these items carefully to make a great honeymoon package. In order to help you to choose them we have curated the best options available. Hotels: As you might already know, hotels will be the crucial part of your honeymoon. Choosing the wrong hotel for you may ruin your stay or it could be the making of a comfortable, relaxing and enjoyable vacation. Therefore it requires the most attention. Thankfully, Santorini and Mykonos offers lots of accommodation alternatives for a wide range of budgets. Below we listed 5 different hotels for each island, from luxurious to average, which we have used frequently in our valued clients’ honeymoon packages. Restaurant for a romantic dinner: A honeymoon without a romantic dinner is like a beach without sand. Thanks to plentiful waters and the fertile soil of the Aegean and Mediterranean area, Greek cuisine offers a variety of choice when it comes to a delicious meal. There are many restaurants and taverns at which you could have a tasty meal at a reasonable price. Below however we have listed 5 exclusive restaurants for each island that, while pricey, are worth every penny, offering great views and memorable experiences. At the end of this article you will find some examples of Greece honeymoon packages that we offer to our valued clients. You can then contact us to update & tailor the itinerary more to better suit your needs & preferences. Santorini is probably one of the most intriguing destinations in the Cyclades group of islands. Stunning sunsets, amazing scenery, beaches of black, red & gold colored sands, museums, archaeological sites, traditional houses & churches … this islands offers many attractions & a wide-range of activities. It has also become a famous wedding destination for those that wish to not only spend their honeymoon here but also have the ceremony take place with its wonders as a backdrop. A dream for many to capture a few colorful and reflective moments, not forgetting of course numerous kisses, under the glorious sunset provided by mother nature. This island is truel the #1 location for honeymoon travelers and should be included during any Greece honeymoon travel package. One of the most popular hotels for honeymooners, keep in mind that you need to make your reservation at least 3-4 months in advance to get a room here. Argo restaurant offers delicious cuisine and spectacular views of the Caldera from its terrace. They offer a rich menu and excellent service from their professional chef & waitstaff. Make a reservation in advance to assure one of their best tables with an amazing view. Selene Restaurant is located in Pyrgos (the highest peak of the island) and celebrated its 30th anniversary last year. They offer gourmet food and special wine. You can also join their cooking courses if you are looking to add something different to your travel experience. Please keep in mind that you need to make reservation via email or by phone at least 48 hours in advance. Kamari: situated next to Perissa, with an enormous rock called Mesa Vouno between them. Perissa: impressive & organized beach, with black sand. Remains of Ancient Thera are close by. 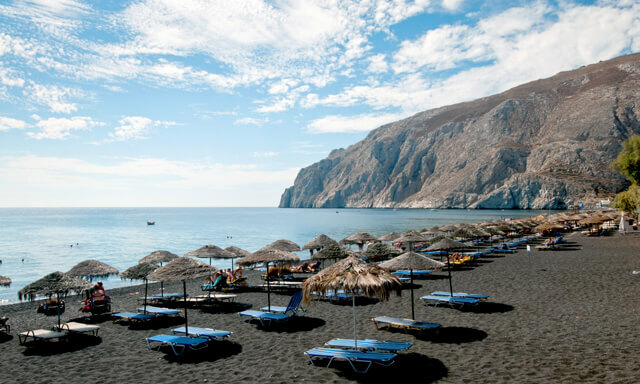 Perivolos: the longest black sand beach of Santorini with many hotels, tavernas & beach bars. 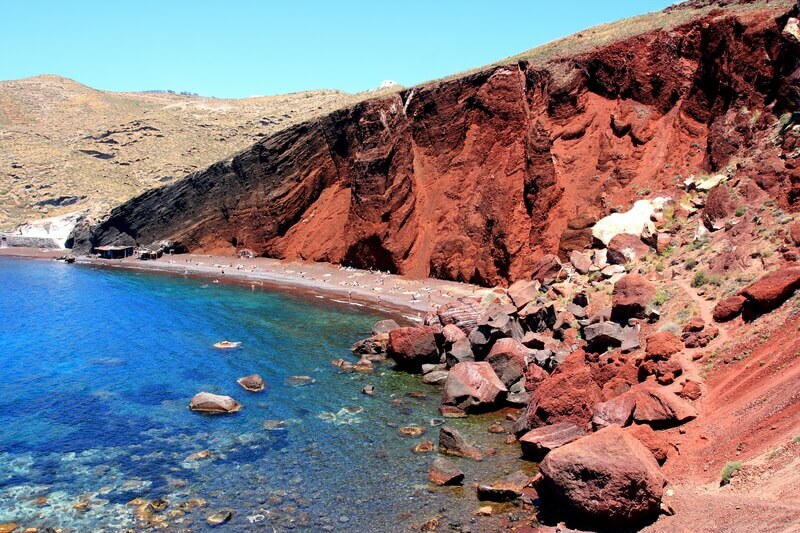 Red Beach: one of the most beautiful and famous, with black & red volcanic pebbles and hot water. The most famous and cosmopolitan island of Greece, it is here in Mykonos that you can find travelers from all walks of life enjoying their place under the heart warming rays of the summer sun. Its fabulous beaches, meandering cobble stoned streets & whitewashed villages, all call out for you to leave your cares behind and enjoy a few magical days in paradise. The tantalizing cuisine of local restaurants urge you to treat your taste buds then head out to one of the hopping bars & clubs to dance the night away. An island offering escape for those that just wish to relax or a chance to party like never before for those that enjoy great nights out. Either way, don’t forget to make some time to also explore the island’s history and traditions too. Little Venice: variety of cozy restaurants, bars, shops and nightclubs, bustling at all hours. Iconic Windmills: from their hilltop location you can see the town & harbor in the distance. Ano Mera: the island’s only other real town & not as crowded, home to 2 monasteries. 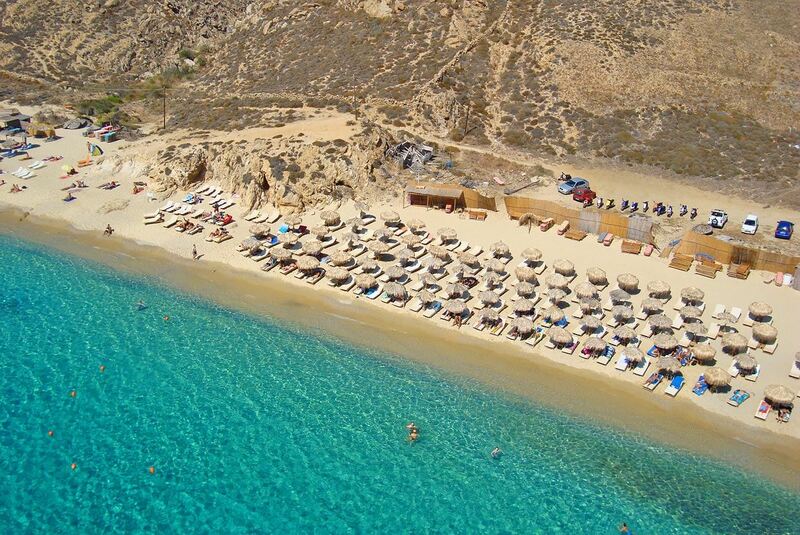 Elia: one of the longest & most popular; umbrellas, sun beds and beach bars dot the coastline. Paradise: one of the most famous, attracting mostly young crowds for its day & night beach parties. Platis Gialos: well-organized, sandy and clean, also easy to reach from the main town. There is so much going for Crete, the largest island in Greece, that it is difficult to limit it to only one short introductory paragraph. From glistening covers with sandy beaches, to noble mountaintops, through fertile valleys & steep gorges, this island bursts with the relics of numerous civilizations & astounding natural beauty … all ready and waiting for you to discover! A stay of 2 days might be enough explore the highlights of its main city Heraklion & nearby Knossos Palace or relax at one of its numerous resorts, but you would need a lifetime to truly appreciate all its treasures, not least of which is its rich gastronomic culture. Crete is one of the islands that is great all year round, not only just for the summer months. To read the itineraries and get a quote please click here. There are many factors such as length of stay, class of hotels, month of travel, number of activities you decide to include, etc. that will affect the total budget for your Greece honeymoon. It will be determined according to your preferences therefore it is not that easy to give a “general off the cuff estimate”. A hotel may cost 100$ per night or 1000$ per night. The hotels mentioned in this article are luxury options but we do also cater for those with a leaner budget. Feel free to complete the form at the end of this article (noting all items that you would like to include / items that would make this the best experience for you) and we will be happy to revert with more details and a price estimate (quote). The best time to visit Greece – when taking into account factors such as weather, crowds & budget – are mid April through mid June & from mid September through mid October. During these months you can enjoy pleasant sun filled days with light breezes, not have to endure overcrowding (half of Europe spends its July-August summer holidays here) and there is also a greater chance of finding availability in the hotels of your dreams. The peak months of July & August, with its scorching sun, may be difficult to endure for those that are not wanting to spend most of their time swimming in the sea or lazing on the beach suntanning. Winter season is not the best choice for island hopping itineraries, though still possible of course, as many ferry companies stop operating numerous routes & connections during these months and 90% of hotels and restaurants are closed on the islands. Winter is more a time to experience the treasures of the mainland for those that wish to focus on history and archaeological sites. We, 7 Wonders Travel, would be happy to help you plan your Greece Honeymoon and build a package according to your needs and preferences. Please complete the form noting all your preferences in detail. We will then send you full offer & quote as soon as possible.